Keepers of legend and witness to nature's greatest movement, mountains are regarded with awe and admiration by every culture that has these staggering wonders in its midst. 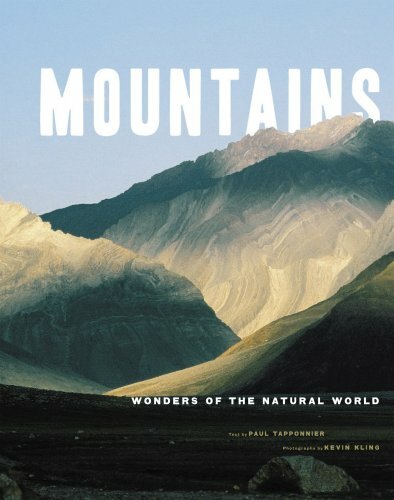 In this stunning book, a geologist and a nature photographer provide a tour of the world's most spectacular mountain ranges, revealing their fascinating scientific origins and tracing their natural histories. Studying closely the young mountains found in the Himalayas and Andes ranges, and explaining why ranges like the Rockies are dying, the book's incisive text reveals the secrets of a mountain's birth, its endurance against erosive elements, and its march towards an inevitable demise. Illustrated throughout with breathtaking photographs, Mountains shows how these natural wonders are living creatures unto themselves. Publisher: "Harry N. Abrams, Inc."